They say there are no evidence (sic) for perishable texts in the Indus Corpus. This is not true. We have the impression on the back of a clay sealing of a text that was carved on a wooden doweling (Mackay, Vol. 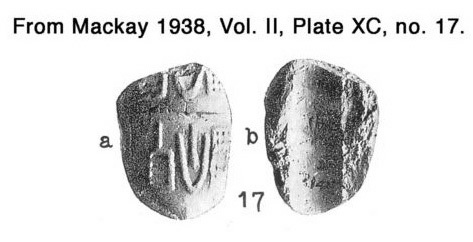 II, Plate XC:17) and has 9+ signs. The text runs the full length of the sealing and seems to run off in both directions. It is in very rough shape and the sealing picks up only the bottom of the signs. Nevertheless., this is proof of two things. First, Farmer et al have no clue as to what is in the Corpus (or chooses to ignore data that are in opposition to his views) and second, that Indus people carved texts in wood. Wells earlier made this claim - it is easy to falsify if you check the evidence (see below) - to a German reporter in late January. E.J.H. Mackay (Further Excavations of Mohenjo-daro 1938, Vol. 1, p. 349) correctly identified the piece in question as a tiny seal impression - that is, a small piece of clay (known to researchers as a 'tag') that carries the impression of a seal. The clay was apparently wrapped around a wooden rod. The artifact (see the picture below) is certainly not a "text" carved on wood, as Wells tells us. Seal impressions like this were very common in the Near East, where they were used for various purposes (mainly securing goods). Examples from the Indus Valley are discussed in an important paper in press on artifacts from Lothal (a major Indus site) written by Maurizio Tosi and Dennys Frenez. No. 17 in Pl. XC is certainly a true sealing [i.e., a clay seal impression] and it owes its preservation to having been slightly burnt; it was once fastened to some such object as a smooth wooden rod. Readers familiar with Indus signs will quickly note that there are not "9+ signs" on this piece, as Wells also tells us. The seal impression on the clay 'tag' was apparently made by a small seal stamped twice on the clay surrounding the rod (this again follows a well-known procedure in this type of artifact). There are perhaps six signs or partial signs shown on the piece, and perhaps only three unique signs total. This is the evidence that Wells claims (without showing the photo) to argue that Michael Witzel, Richard Sproat, and I "have no clue as to what is in the Corpus" and to argue that the Harappans carved "texts" in wood.